1. Put them in the fridge. 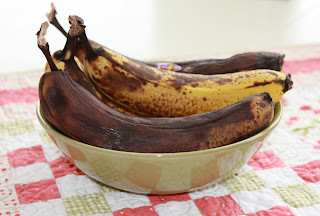 Did you know if you put your bananas in the fridge the outside turns black more quickly, but the inside stays good for longer. 2. Freeze them. Did you know you can freeze your bananas when they look like this? It's true. Just put the whole banana in the freezer and pull it out when you are ready to use it. 3. Make something. There are a lot of recipes that call for "ripe" bananas. So make something. So from now on I hope you will think twice before throwing away those bananas, they are good for something.